Ron Parker, of Courtland Township, recently sent us photos of his pretty peonies, and this beautiful butterfly. “The Swallowtail butterfly is the most perfect butterfly I have seen; usually their wings have already started to be beaten up by living their short lives,” he wrote. Thank you so much, Ron, for sharing your wild life and wild flower photography with us! If you have wild life or wild flower photos you’d like to send us, please email them to news@cedarspringspost.com. We will run them as space allows. Some people might wonder why the Monarch butterfly is currently proposed for Federal Endangered Species status. Monarch numbers have declined significantly during this new millennium and there are several contributing factors. One concern is the use of genetically modified organisms (GMO). GMO crops have been genetically altered to be herbicide resistant so more chemicals can be used on crops, allowing higher yield to support our growing human population. It is difficult for farmers to purchase seeds that are not genetically modified. 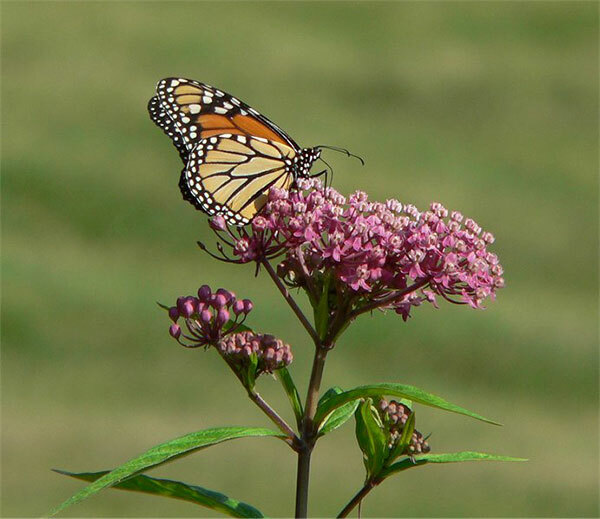 The increased use of chemicals in farm fields has eliminated many of the milkweeds that Monarch butterflies require to successfully migrate from Mexico to Michigan. Lincoln Brower conducted studies in the 1960’s to gain understanding about how Monarchs acquire chemicals from milkweeds that protect them from bird predators. Milkweeds developed chemical protections through natural selection that protected them from most insects trying to feed on them. Most insects cannot feed on milkweeds because of the plant’s poisons. Monarchs, milkweeds bugs, milkweed longhorned beetles and some others have developed the ability to feed on the plant and have developed ways to isolate the poisons without being killed. Brower fed Monarchs to blue jays and the birds became ill, vomited, and had an irregular heartbeat. The birds learned to not eat Monarchs or other orange insects. 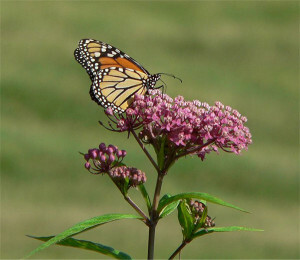 Later other scientists studied cardiac glucocides ingested by monarch’s from the milkweeds to learn how they affect the heart. It was discovered that if a person has an irregular heartbeat, the chemical could be used to help correct the heartbeat. After learning its medical value, the chemical has been manufactured in the laboratory and used to save human lives. If monarchs were allowed to become extinct before the study, we might never have made the life saving discovery. Many, if not most, medicines first come from studying plants, fungi, and other organisms to understand their role in nature niches. Scientists do not just throw chemicals together and test them to see how they might be useful. They look to the natural world. Butterfly and other insect surveys conducted by citizen scientists aid in monitoring the abundance and distribution of insects. Similar surveys for birds, mammals, and plants help us understand trends for various species populations. Most species have not been studied for their value to humans. The value of many has been lost to extinction and will never reveal their life saving secrets. What if the chemical in milkweeds and Monarchs was lost before the life saving use was discovered? The recent local butterfly survey conducted by citizens like you has value for fun and learning about local nature niche relationships. It also is important in tracking population changes. The information can be used to preserve species that save human lives. Some people require a known human use before they are willing to support saving a species from extinction. It is impossible to know the value of each species. It is estimated that between five and fifteen million species live on Earth and possibly 30 million. We have named about 1.5 million so far and, for most of those, we know little about their value for us. Insects that live in your yard might be human life saving organisms provided we do not eliminate them with pesticide and herbicide use. You have life saving control that is important for future generations. If we eliminate species, their value disappears with them. Encourage people to live in harmony with nature rather than trying to dominate it. Natural history questions or topic suggestions can be directed to Ranger Steve (Mueller) at odybrook@chartermi.net, or mail Ody Brook Nature Sanctuary, 13010 Northland Dr, Cedar Springs, MI 49319. 616-696-1753. Immobile and vulnerable all winter, the Giant Swallowtail waits. It has many adaptations for survival. During the winter wait, it is too cold to do anything but wait. Enclosed in a chrysalis it transforms from caterpillar to winged jewel. It transforms within its last larval skin during the fall from a full-grown caterpillar to a chrysalis in a hidden location. Inside the jewel of a chrysalis, body tissues of the caterpillar dissolve to an apparent liquid. Primordial cells actively work to rebuild an adult body through most miraculous changes. Cool or cold weather delay completion of the work for weeks or months. In the more southern states the wait between caterpillar and adult is shortest. Warm weather arrives sooner allowing the transformation process to continue. In Michigan it is thought that the process never completes and the butterfly freezes to death in the chrysalis before spring arrives. 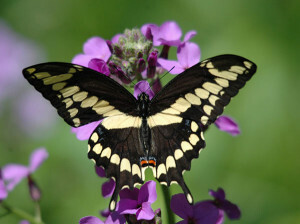 The result is that we have no Giant Swallowtails until some immigrate north to colonize the state with a new population. I disagree in part with such thoughts. I have seen Giant Swallowtails year after year at Ody Brook where the host plant for the caterpillar is abundant and have found them in repeated years in other patches of Xanthoxylem americanum. In still other patches of the prickly ash, I have been unable to find the butterfly. That led me to the scientific hypothesis that some swallowtails survive in isolated patches to provide an ongoing legacy. To further support the hypothesis, I discovered that reliable patches containing the butterfly year after year had none after a very cold winter with subzero temperatures. It took a few years before those patches supported the species again. My idea is that it took a few years for immigrants to find populations of the host plant. When host plants are found by an adult swallowtail, it lays eggs that develop into bird turd looking caterpillars that fed on the leaves. Caterpillars pupate and develop into adults by fall to provide many beauties in landscapes with host plants. Those pupating in fall wait the long winter. Many freeze but a few might survive to maintain a population in isolated patches of prickly ash. This is still not scientifically proven. To scientific prove my hypothesis, it is necessary to provide evidence that chrysalises survived the winter in the wild. I have not looked for or found supporting evidence. That does not mean they do not survive. It means there is no supporting evidence that some survive winter in this climate. This skeptical process is what makes scientific method so valuable and self-correcting. It dispels unsupported information that we often choose to believe because we want to or because it appears logical. Through scientific process we learned the sun does not rise in the east and set in the west. Instead we discovered the Earth rotates to provide the illusion of sunrise and sunset. 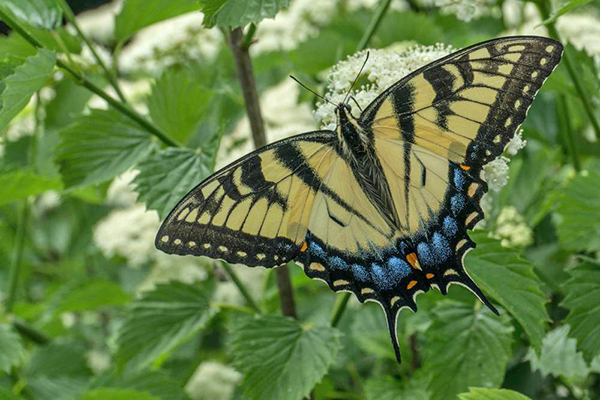 For now, science supports that Giant Swallowtails do not survive Michigan winters. I expect any Giant Swallowtail chrysalises found this winter will be frozen. Immigrants will be essential if we are to see the species this summer. The winter provided chilling subzero temperatures in local nature niches. Maybe the deep snow covered and protected a few precious winged jewels. This Monarch butterfly appears to be getting some last minute nectar before hitting the highway to Mexico. “I was really surprised to see a Monarch still here in October,” said Chris McFarlane, of Nelson Township, who took this photo of a Monarch butterfly perched on a New England aster on October 23. Monarch butterflies migrate to Mexico every year, traveling thousands of miles. They then come back in the spring and lay eggs. 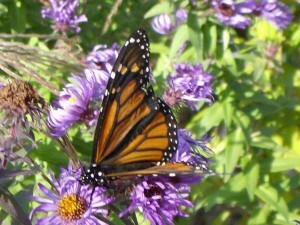 There have been a few Monarchs spotted in other northern areas at this late date. The problem with that is that as winter approaches, the nectar dries up and the butterflies might not make it to Mexico. According to Sue, the praying mantis was stalking a small spider on the handle of her planter and he was successful! She said the hummingbird and the butterfly were both after the nectar of the Rose-of-Sharon flowers on the bush next to their house. If you have wildlife photos you’d like to send, email them to news@cedarspringspost.com with a short summary or explanation.